Each piece is constructed of extra-heavy stainless steel and guaranteed to last a lifetime. Steam Control' valves make "water less" cooking easy and the 7-ply construction spreads heat quickly and evenly, allowing one to stack cook. 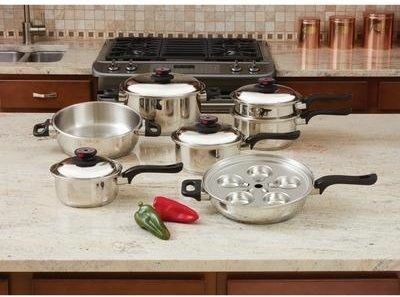 Cookware is also equipped with superbly styled phenolic handles resistant to heat, cold and detergents. Comes with a limited lifetime warranty. Made in Korea. White box.